The very first thing to ensure is that you have a safe Boat. A nautical definition would be 'well-founded'. In other words, your boat is in good repair, is well-maintained and well-equipped. A safe boat is one whose hull has been inspected to discover any flaws or damage that could compromise her stability. There is an old sailing proverb that says 'no man moves faster than a sailor pumping on a flooding vessel'. You never want to put that to the test. There should be wooden plugs secured to each thru-hull. Seacocks should be checked to ensure they are in working order and not frozen from years of neglect. A safe boat is mechanically sound. Is the engine in good running order? Has it been serviced regularly? Do you have the records? If not, the prudent thing to do is to have a qualified mechanic inspect it. You may be depending heavily on it when entering a strange harbor in a storm. If it quits, you won't be thinking about how much money you saved by skipping an inspection! 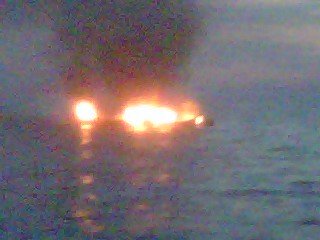 Outside of sinking, fire is the greatest threat to a boat. A fire on board grows with breathtaking speed and the destruction is enormous. 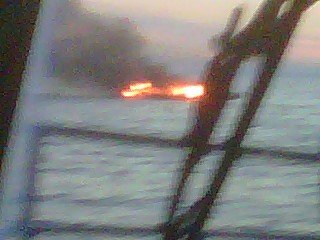 The photo on this page is a vessel fire to which that our CCGA unit was dispatched. There was no loss of life as the couple who were forced to jump into the lake were rescued but the destruction was total. Fire extinguishers are a key part of a safe boat. Fire extinguishers should be present in the galley, in or near the engine compartment and in sleeping quarters. I have never heard anyone who has fought a fire complain that they had too many extinguishers at hand! Fire blankets are also very useful and can help smother a fire in the galley or engine compartment. Your ground tackle (anchors and anchor rode) has to be of sufficient size to hold your vessel when you anchor and of sufficient variety or versatility to work in the areas in which you sail. And you need ample rode (the only 'rope' on a boat that is not a 'line') with a good amount of chain to complete the ground tackle requirements. Check the attachment points as well – awfully embarrassing to release the anchor and watch the rode – every last inch of it - disappear over the side. A safe boat has all navigation lights working. You must be seen so other vessels can take appropriate action when they see you. Replace burnt bulbs and cracked or broken lens. Have spare bulbs as well. Check that interior lights are working. Flashlights are always useful, especially around a dock at night. Have an ample supply of batteries. A powerful light aimed off a mainsail at night helps with visibility near commercial traffic. 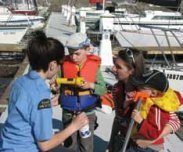 Another component of a safe boat is her emergency pump system. Do the pumps work? Are there manual pumps in case the power goes out? A three-inch hole one foot below the waterline will allow 177 gallons/675 liters of water into the boat each minute. That's 1,416 lbs/675 kg per minute! The same size hole three feet below the waterline will let in 306 gallons/1,163 kg gallons a minute – 1.2 tons/1.16 metric tonnes of water each minute! Any sizable hole below the waterline will sink the average boat in a matter of minutes. Most automatic pumps will not pump close to their rated volume. So, at least here, bigger is definitely better. Have all of the required legal safety equipment for your home waters. If you are cruising in other waters, you need meet only the requirements of your home jurisdiction. Failure to comply can result in significant fines and open the door to liability in the event of a mishap. Treat the legal requirements as minimums. A safe boat has all electronic equipment in working order. Chart plotters and radar are nice options to have but a VHF radio with Digital Select Calling (DSC) is vital. It is your electronic link to Coast Guard and Search and Rescue (SAR) facilities. Reliance on a cell phone is downright dangerous. A VHF emergency call is heard by every vessel within a range of 10-25 nm. A cell phone is heard by only one person – if they answer. VHF radios are designed to operate in a marine environment. Water is not a friend to your cell phone. Keep a card by the radio that details the steps in making a MAYDAY call – it may have to be used by a guest. 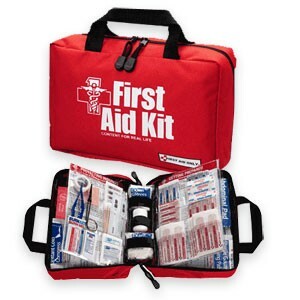 A safe boat carries a well-stocked first aid kit. The kit should include a manual. You should also know how to use the kit. Take a first aid course – a marine one, if possible. Your local Coast Guard Auxiliary unit, yacht club or boater organization should be able to direct you to a trainer. Its worth the money. Check the kit every year, restocking used items and replacing expired products. Hypothermia is a real threat on the Great Lakes. This threat is increased in the early and late months of the sailing season. For example, summer temperatures on Lake Superior can average 40oF/4oC and Lake Ontario can see average summer temperatures around 68°F/20°C. 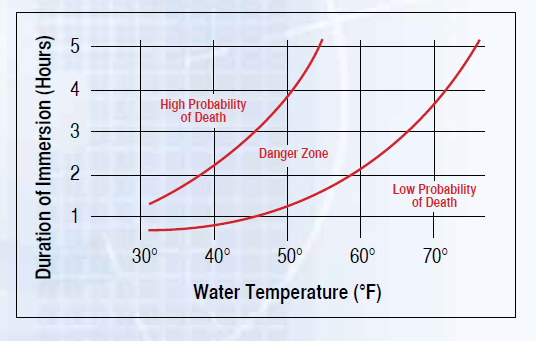 The onset of hypothermia is rapid and the results can be fatal. And you don't have to go overboard either. Long hours at the helm in rough weather or pouring rain can bring on hypothermia as well. Standard first aid equipment should include a sleeping bag and change of clothes (a wool sweater, loose gym pants and wool socks) and some large plastic garbage bags (to put on the outside of the sleeping bag to create a vapour barrier. 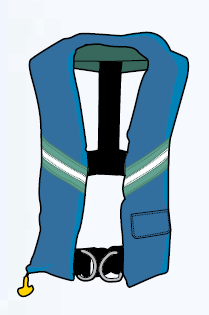 Personally, I like the full vest-style PFD with a collar. That collar will keep your head out of the water when you are exhausted. It will provide some additional insulation if you are in the water any length of time. Available in various colours, choose a high-visibility colour. Remember – the object of the exercise is to be seen. The pockets can be used to store some emergency items – such as small, hand-held flares, a signal mirror, a whistle or a small flashlight. This is not overkill. Water will wick away body heat 25 times faster than air – up to 250 times faster if there is a wind. In the water, you will have about 10 minutes of useable muscle control before you are so cold you can only float – and then you will be relying solely on your PFD to keep you alive until help arrives. 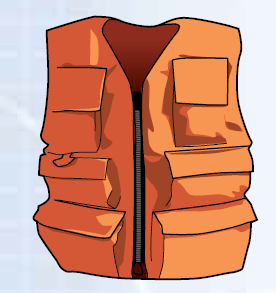 Along with PFD's, you should have safety harnesses for crew to wear at night, during stormy weather and when sailing single-handed. (And you are sailing single-handed if your sailing partner cannot manage the boat on their own.) Also, have a a jack line – a line that runs from bow to stern that you can clip your harness onto. Boats must have a life ring to throw to a person in the water (enclosed in Canada; horseshoe-shaped in the United States). Practice throwing to get the feel of it. One or two throw bags with 50+ feet of line are inexpensive, easy to stow additions. A radar reflector is usually mandatory equipment. The larger the reflector, the larger the return signal and the goal is to be seen. 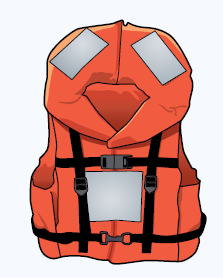 If you carry a life raft, check that required service has been carried out. A safe boat will carry a well-equipped tool box be on board. It should be accompanied by a range of essential spare parts and a supply of batteries. A properly equipped, safe boat should have a full set of paper charts for the areas in which you will be sailing. Chartplotters are great but they rely on power and if that is not present, you have nothing. Along with the chart, have the tools, which can be picked up at a marine supplier or chandlery. Take a navigation course as well. This is an essential skill. There should be an EPIRB (Emergency Position Indicating Radio Beacon) on board. It should be registered. 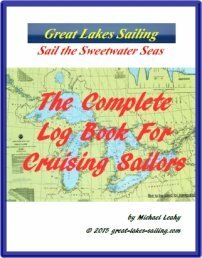 Last but not least, the boat should have a set of manuals for all equipment on board. If a manual is missing, you may be able to locate a downloadable version on the internet. Looking after these details will ensure that you have a sfe boat under you when you leave harbour and set out on an adventure, whether near or far.